A little help for p3. You can go either clockwise or counterclockwise, but spears should be ahead of the boss and the traps (slag bombs) behind his path. If you need some help or want to see what the different phases look like in real time, I made a guide here: https://www.youtube.com/watch?v=Xj64ZHcZagA , I go over the main mechanics of the fight and the general strategy used with footage from my first kill. Hope it helps. I just started raiding on my hunter again as a dwarf and rarely had impale on me. upon reflection, i wondered if stoneform can remove the impaled debuff. also, i think my pet doesnt come up with me to the stands thus i went MM or SV for the fight. I felt that MM with Killshot 15% instant heal on killing blows helped me stay up longer than SV's survivor 15% heal over time. is there a way to bring out pet up? dismiss then resummon or master's call? i didnt try the first but i think when attempting master's call, it said: No path available. has anyone tested whether deterance will allow you to be shattering smashed up to the stands if you face the boss? or having your back to the boss with deterance up? i absolutely hate going up the stands with 20% hp left but in the heat of battle, did not test them yet. In each Demolition spam there will be 4 Démolition massive instead of 3 in Normal/Heroic. Désigné pour mourir will target 3 players instead of 2 in Normal/Heroic. Assiégeur renforcé-Has more HP than normal siegemaker. Assiégeur explosif-Carries bombs that will explode 5 seconds after it dies. Assiégeur en état de supercharge-Moves faster than normal siegemaker. Assiégeur embrasé-Leaves fire behind its path. The cycle of Siegemaker attributes will always be Reinforced->Explosive->Supercharged->Fiery. I don't know if the attribute sequence is completely random or not, but it seems the attribute comes in a cycle of four, so the fifth Siegemaker should have same attribute as the first one. In P3 there are falling Debris that will fall on the ground. If it hits the ground without any player catching it, a Slag Hole will form, which will become an aoe area after Slag Eruption. This needs to be dealt by hunters/mages/shadow priests/paladin's Bénédiction de protection,etc to save space. Just a question regarding impale debuff from blackhand. Will Hand of purity lessen the debuff taken by whoever soak Mark for Death? After finally getting this mean ol' orc down on heroic, one of our raiders made a lovely discovery about how this boss's Shattering Smash ability works. While most guides will tell you that Shattering Smash's knockback is in relation to the position of the center of the circle, they don't tell you how the tank gets knocked back. The tank is not knocked back in relation to Blackhand. They will be knocked back in relation to where their back is facing. What that means is that, if you point your back towards Blackhand (normally a big no-no), you'd be sent flying right through him instead. This is true for all phases of Blackhand, and on all difficulties as far as I know. So, you might be wondering, how does that relate to fighting this boss? Well, we came up with an alternate strategy in Phase 3 to reduce the risk associated with spears. 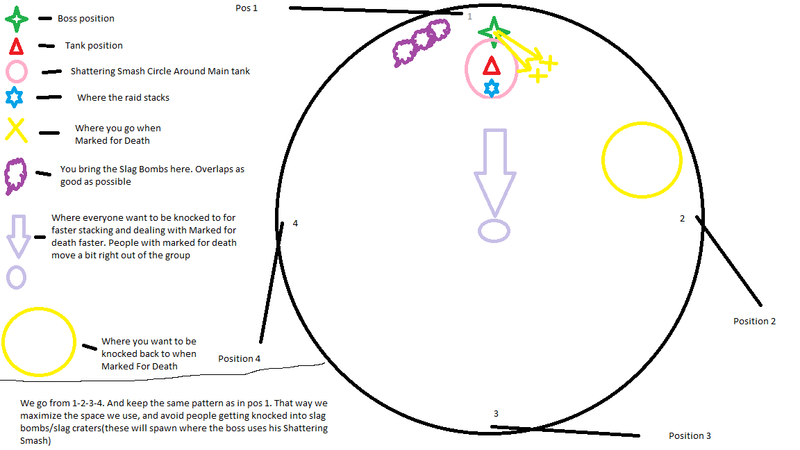 Rather than facing the boss inward, with all the applicable raid members stacking behind the tank, you will be facing the boss on the outside of the ring, with raid members between the tank and Blackhand. When Massive Shattering Smash comes through, the tank needs to quickly turn their back to the boss so they don't get knocked off the platform. The biggest benefit of this approach is that spears have much less chance for overlap into the smash soaking group. It also gives slightly more real estate in P3, and results in a slightly closer knockback. The only major downside is that your tank needs to be quick and paying attention in this phase. If they fail to turn their back to the boss, it'll likely be a wipe. tl;dr version: The tank is knocked back in the direction of their own back in shattering smash. Hopes this helps somebody out there! As of this weekend (1May15) Blackhand's Shattering Smash started hitting me (iLvl 670 Pro Paladin) for 403K after mitigation in phase 1 of the LFR. I think the recent 5MAY15 Hot Fix solved the mystery - it fixed an issue that was causing Blackhand's Slag Bombs to incorrectly explode instantly and the Slagged debuff to incorrectly persist on a character. How do you exit the raid once you kill Blackhand? Is my only option to hearth?